My first time trying to make something 100% custom. Finally trying to make my first quest and the classic set is killing me. How do you all make such great screens?! At first impression, I vote have voted for nicklegends, because his Screenshot looks great. 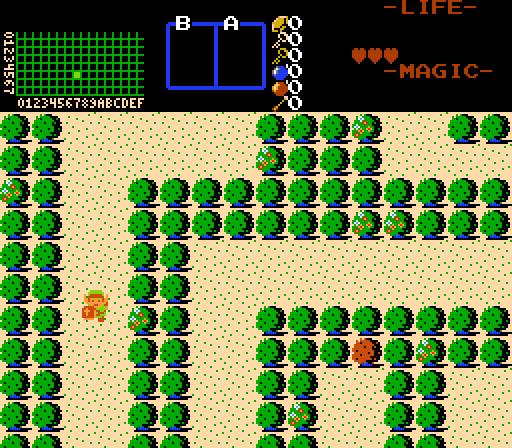 But after looking at it more detailed, I found some flaws that lots of GB-screens have (even the original screens of Links Awakening and the oracle-games). When you look at the corner-mountain-tiles or rock-tiles, you see that they are just white at the corner. 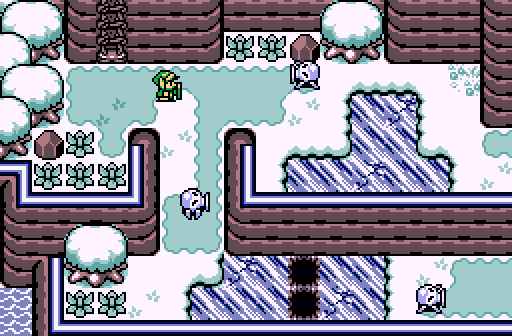 This looks good, when the tiles are beside a snow-tile. But when they are beside a water- or tree-tile, it looks ugly. I know, this is just the style of the GB-screens and I really adore this set. But I try to avoid this kind of flaws and I personally don't want to vote for such a screen, even if it looks great, like this one. In the end I voted for Joelmacool, because his screenshot looks really good for a custom-tile-screen. Entering this contest is also a good idea, because you will get feedback and after that, you know, what you can do better. If you ask me (and that is just my own opinion), making a good looking screenshot with the classic tileset is difficult. I think, it's better to use another tileset-style (like GB, pure, DoR etc.). Those tilesets are bigger and at the beginning very confusing, but it's easier to make a good looking screen, because there is way more variation. The tileset I'm using has about 20 different trees in it, wich would make your screen look better. I voted for Joelmacool. The custom graphics look really good, although the ground tiles are a little noisy. 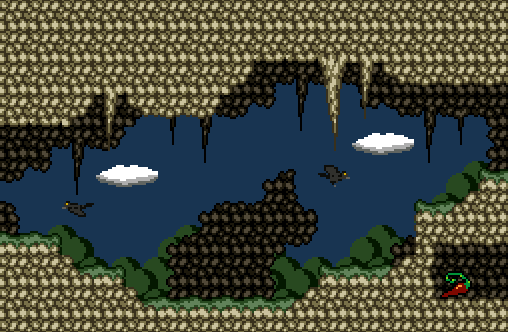 I think the birds look very nice, and the shape of the stalactites is well done. Overall, your screen is very well put together. 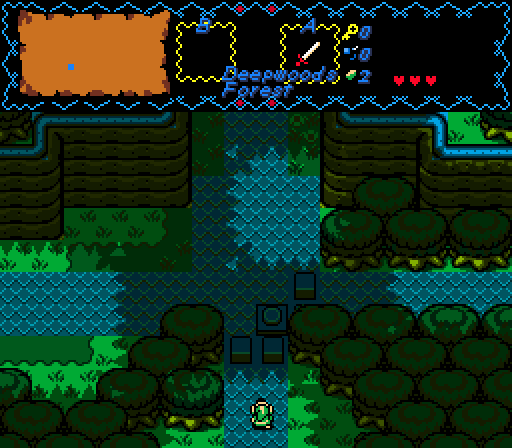 My second choice would have been Nick's screen, which is excellent usage of GB Zelda graphics. I second what Rastael said about the the mountain tile corners. It's a small detail, but it makes a huge difference. Your screen looks decent, but the trees are a little too straight, which makes it look unnatural. Making the trees less orderly will make the screen feel a little more like a forest. Also, I think it looks a little odd that the path suddenly becomes narrower on the north side. However, the ground detail is pretty good on your screen, and I don't have any complaints about the shape of the mountains. Don't worry too much if your screens don't look as good as those made by others on this site. They have been making screens for years. It just takes practice. I made some really bad looking screens when I first starting using Zquest, but I got better after a year or two of making screens. Just had to vote for Joel here, these are nice looking graphics! Maybe a bit too busy, but yeah. The birds should definetly move if this were a real game. Chris, don't worry this isn't bad. I think it would be fine in a quest. For SotW it's not spectacular enough, it could use more variety like mountains and rivers. Also, basic classic screenshots generally don't get voted much in SotW. Still, good foundation in case you want to make a quest. Edited by Avataro, 10 February 2019 - 03:53 PM. Edited by SkyLizardGirl, 13 February 2019 - 12:54 AM. Joelmacool: I'm not entirely sure why, but I get Kirby's Adventure vibes from this, even though it doesn't look like it at all. Love the screen and the graphics though. TheRock: I'm actually quite impressed that you managed to fit dungeon tiles into the overworld so well. nicklegends: This is just a beautiful screen. Classic GB tileset right here. Chris: I struggle to make classic screens look good too, but I've actually seen some people do marvelous work with the classic set. Aside from the GB set, classic is my favorite to both use and look at. I think it tends to get used most effectively when people add very slight modifications that suit whatever they're trying to do, like a subtle color change or somewhat-altered version of a pre-existing tile. I made a (horrible) quest using the classic set and most of the changes I made were just to the palette, but I think they looked decent enough for what it was. My vote is going to Joel this week. I love all the screens, but I'm really digging the custom tileset/side-scrolling combo here. With 46.15% of the vote, the winner of Screenshot of the Week 691 is Joelmacool!